The EUSA Convention formally started with a reception at the Rectorate of the University of Ljubljana on Friday, November 14. 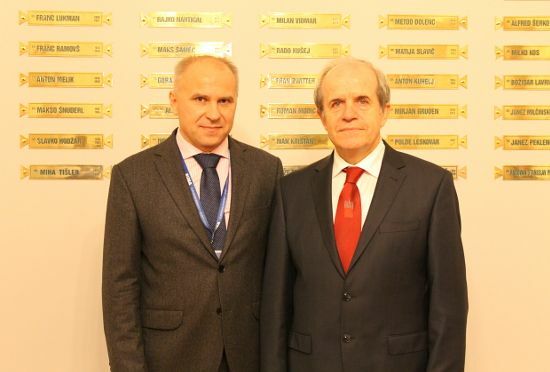 The Rector of the University of Ljubljana prof. dr. Ivan Svetlik first met with the President of the European University Sports Association (EUSA) Mr Adam Roczek, in the company of the Honorary President of the Slovenian University Sports Association (SUSA) prof. dr. Otmar Kugovnik. 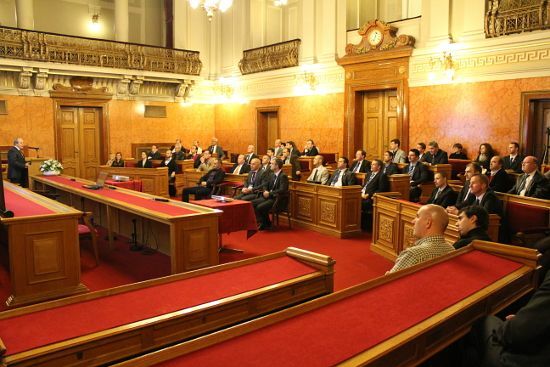 The University of Ljubljana is an important partner of EUSA. 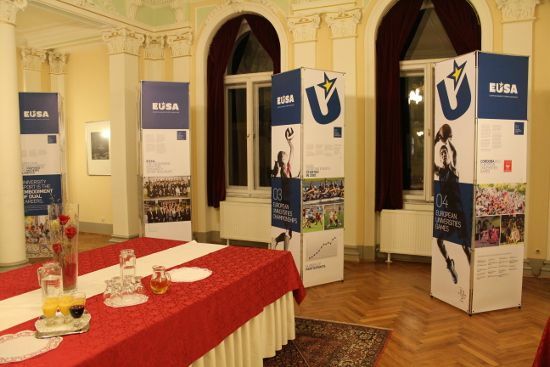 University of Ljubljana has been active in the participation of EUSA events ever since the first competitions. Not only were the students from the University of Ljubljana participating at the European Universities Championships, but they were also very successful. 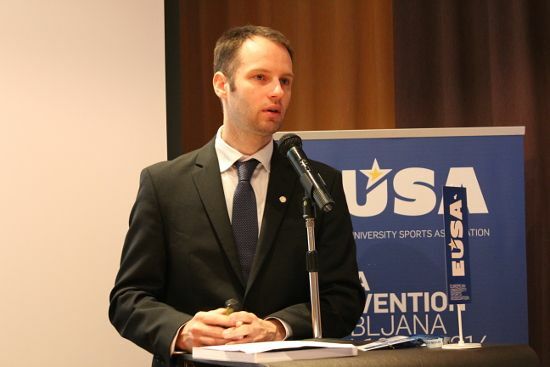 The University of Ljubljana was awarded by EUSA as the Best University in Europe between 1999 and 2009 due to the achievements and participation at EUSA sports events in that period. 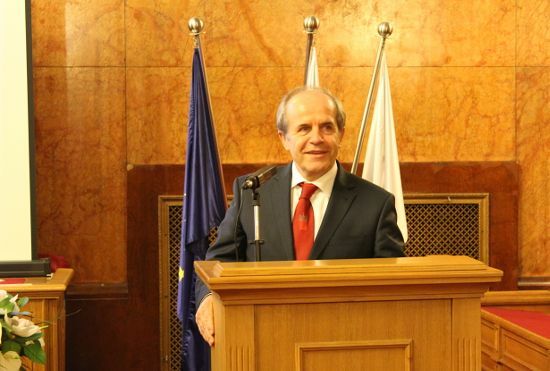 The participants of the EUSA convention – organisers of the European Universities Championships 2015, European Universities Games 2014 and 2016, Technical Commission and Medical Commission members, EUSA Office and invited guests, were greeted by the Rector at a special reception. After a short introduction of the University, EUSA President Mr Adam Roczek presented a special EUSA plaquette to Mr Svetlik, stressing that the cooperation between University of Ljubljana and EUSA has also been demonstrated in the hospitality of the University by hosting the offices of EUSA right at the University’s Rectorate in the past. After the general presentations and welcome speeches, the participants were able to view and explore the EUSA exhibition, a traveling exhibition on university sport. The exhibition, supported by the International University Sports Federation, illustrates the history of EUSA and university sport in Europe. After a social conclusion at the University, the first day of the EUSA Convention continued with a formal dinner. 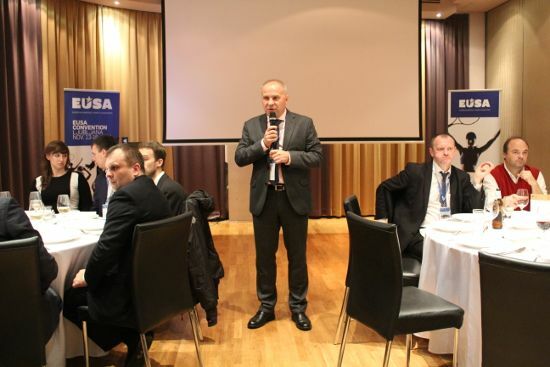 The participants were addressed by EUSA President Mr Adam Roczek who welcomed them to Ljubljana, thanking them for their involvement, wishing them a fruitful and productive meeting and wishing them a pleasant stay at this EUSA event. During the dinner, EUSA Secretary General Mr Matjaz Pecovnik first invited the President of the Board of the Organising Committee of the European Universities Games Rotterdam 2014 Mr Daniel Sikkens on stage. 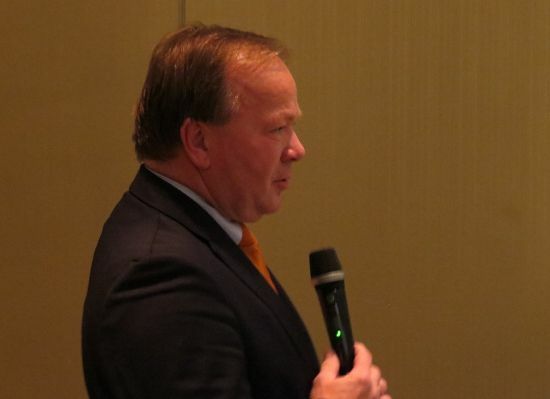 Mr Sikkens shared the highlights from the event, stressing the importance of the European Universities Games and the support of the partners and the European Union through the Erasmus+ programme. He thanked EUSA for the cooperation throughout all phases of the event and wished all the best to the organisers of next events. 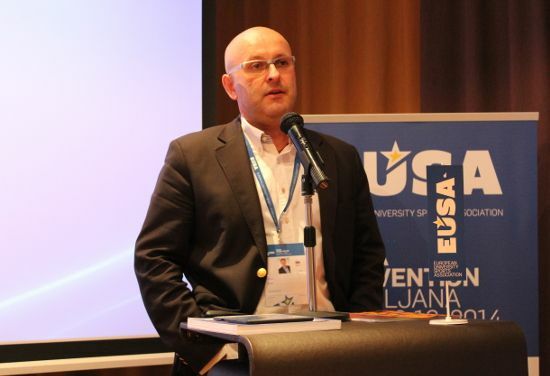 Later, on behalf of the Organising Committee of the European Universities Games Zagreb-Rijeka 2016 Mr Nikola Vincetic presented the concept of the event, their plans and expectations, welcoming everyone to attend the event in Croatia in 2016. 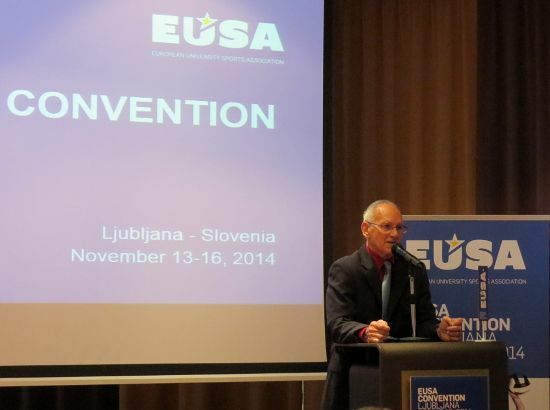 The EUSA Convention continued on Saturday, November 15, with a full day agenda. 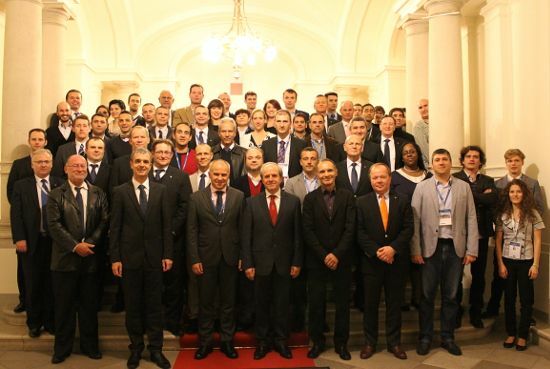 Participants were the Organisers of the European Universities Championships 2015, Organisers of the European Universities Games 2014 and 2016, Technical and Medical Commission members, EUSA staff and invited guests met in Ljubljana, Slovenia, to develop closer cooperation and enable best conditions for the participants of EUSA sporting event – student athletes. The Saturday meeting started with a welcome address by Mr Adam Roczek, EUSA President, followed by a guest speaker – Mr Miroslav Cerar, Vice-President of the European Fair Play Movement (EFPM). Mr Cerar stressed the importance of fair play and non-discrimination, and congratulated EUSA again for receiving the European Fair Play Merit and Diploma in 2014. Mr Matjaz Pecovnik, EUSA Secretary General briefly introduced the European University Sports Association in general, EUSA involvement in international projects, with the ongoing ones among which the volunteering projects within EUSA through EVS and internship and Sport Employs Europe – project on youth employability in and through sport, were stressed. 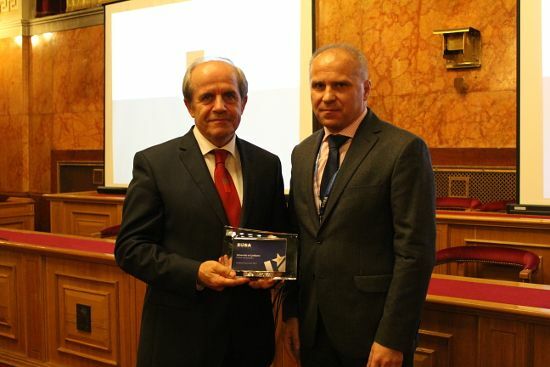 He concluded with the history and mission of the European Universities Championships. 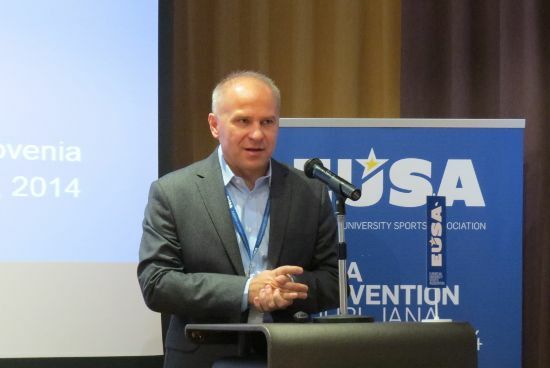 Mr Patrik Perosa, EUSA Sports Manager, lead the participants through a more detailed presentation of the organisation of European Universities Championships, focusing also on Regulations, Technical Requirements and Guidelines how to organise a quality event. 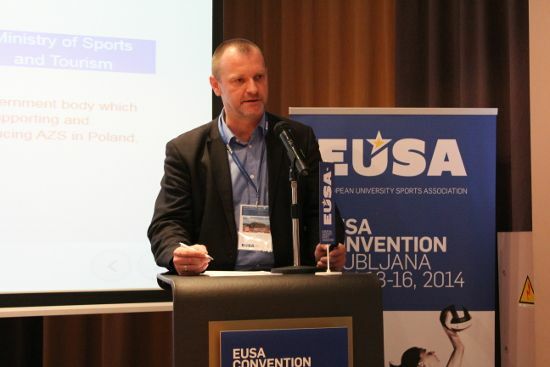 Mr Andrej Pisl, EUSA Communications and Projects Manager presented the Registration and Accreditation System that is offering organisers of EUSA sporting events use of these tools as a service provided by EUSA, explaining in more details the process and rules of registration. 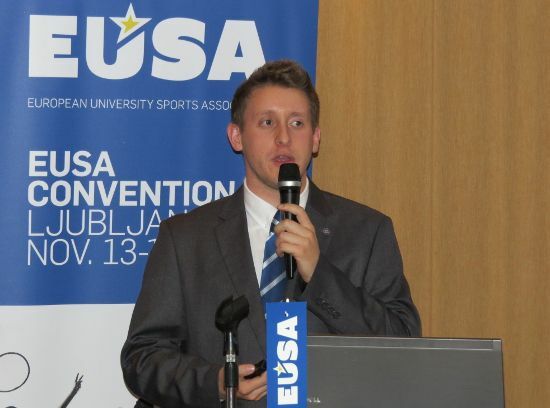 Later on, he also presented the EUSA volunteer programme, which is coordinated by EUSA Student Commission, and enables students of European Universities a chance to get experiences in organising international sports events through participation at EUSA sports events. 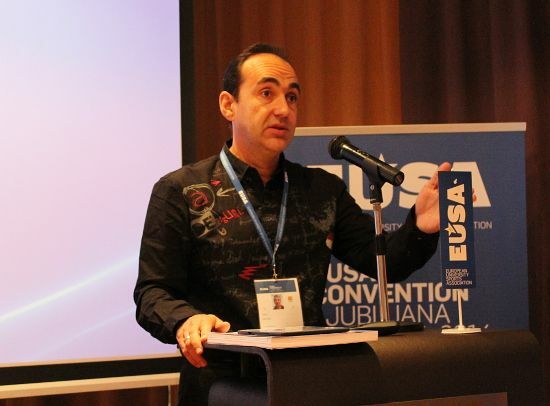 EUSA visual identity and the importance of an overall harmonisation of the graphical elements of EUSA and the Organisers of EUSA events was presented by Mr Tomaz Gaube, CEO of Kraft & Werk marketing agency, a partner of EUSA. In the afternoon part the organisers also had a chance for individual consultations regarding their visual identity. 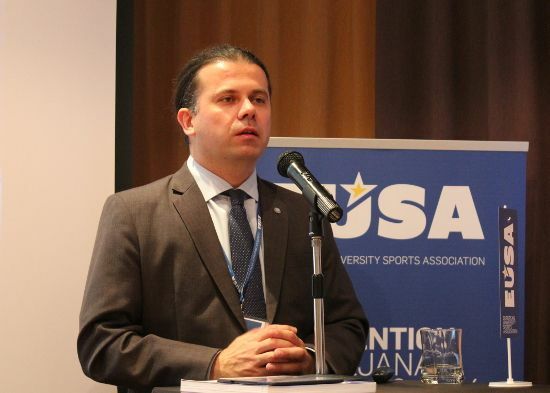 A practical example of a successful European Universities Championship was presented by Mr Pablo Martinez Martinez from the University of Almeria, on behalf of the Organising Committee of the European Universities Football Championship 2013. Mr Martinez explained the preparation, execution and reporting phases of organising the event, stressing the points of importance and giving some recommendations to his fellow organisers. The Organisers of the 2015 European Universities Championships then split in two groups – outdoor and indoor sports. 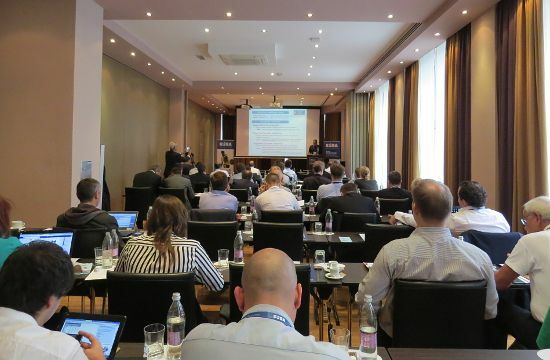 This part was moderated by the Vice-Presidents of the Technical Committee – Mr Piotr Marszal and Mr Marko Zunic. They invited representatives of each organising committee to give a plenary presentation of their events, giving them a chance to promote their Championship and inform others about their plans. 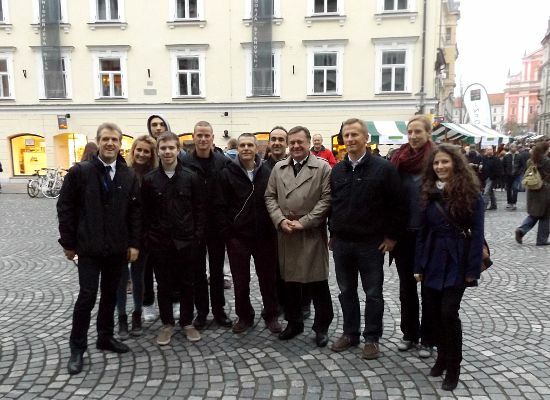 After lunch break, the participants were able to enjoy a guided sightseeing tour of Ljubljana, where they were able to explore the city and also meet the Major of Ljubljana Mr Zoran Jankovic, who is a great supporter of university sport. 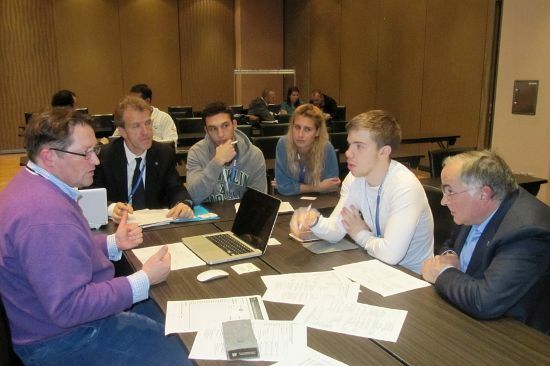 In the afternoon, each organiser had individual workshops and consultation regarding their event, meeting with the Technical Delegates of their sport and assisted by EUSA staff. This was a very important part in the programme, as the Organisers were able present their progress report and plans in more details, also addressing potential challenges and finding solutions together with EUSA experts. 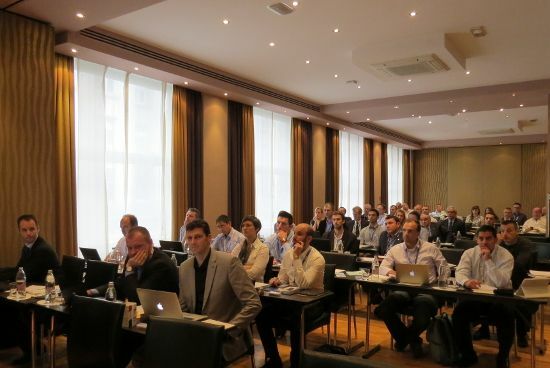 The EUSA Convention then formally closed in the evening by a concluding plenary part, where the Technical Delegates made a short recap of the Championship per sport, highlighting the most relevant areas. 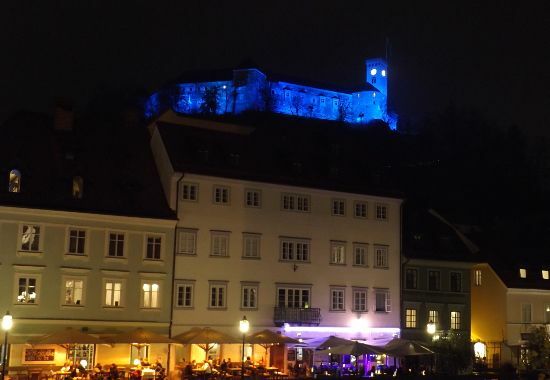 All the participants were invited to a closing dinner in a traditional Slovenian restaurant in the City centre of Ljubljana, where they were also able to socialise, network and enjoy the rest of their stay in the Slovenian capital. 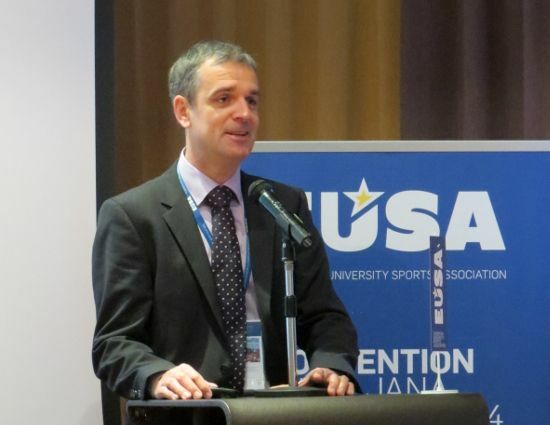 EUSA Convention is supported by the International University Sport Federation (FISU). For more photos, please see the EUSA Facebook album.